As your business grows in size and complexity, and your customers expect better and faster service, the tools that once supported you may now be standing in your way. For growing businesses, deciding to overhaul your accounting software or business management systems may seem like a daunting task. But what is the real cost of trying to maintain a system that is no longer keeping up with demands? Whether the result is lost sales, customer dissatisfaction, or compliance risks, failing to update your technology can be a costly decision. The Signs are Clear, Now What? With so many technology vendors competing for your business, it can be tricky to differentiate between solutions and find the best fit for your business. banking apps, CRM systems, or custom APIs. Connects your entire business. Automatically pulls your systems and processes together so your people don’t have to. 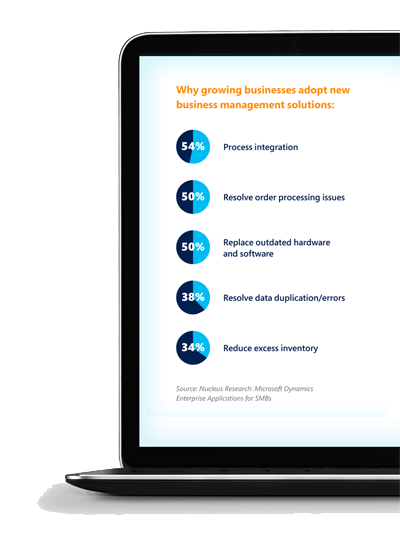 Automates and secures business processes. Improve productivity and get more done with easy-to-create workflows, audit trails, and enterprise-level security—features that basic accounting software can’t provide. Provide an end-to-end view of your business. Centralize your data from accounting, sales, purchasing, inventory, and customer interactions to get an accurate end-to-end view of your business. All data stays up to date so you can spot trends, prevent issues, and deliver great customer experiences. Trusted technology provider. Creates security as a trusted, leading technology provider for businesses of all sizes around the world. Enables mobility. Empowers a mobile workforce by delivering the same experience across devices, regardless of their location. Fast from the start. Delivers an easy-to-learn solution that people just intuitively know how to use. Beyond evaluating the technical capabilities, here are a few questions to ask when meeting with potential solution providers. How easy is the solution to learn and use? How will it integrate with our existing systems and applications? If we deploy in the cloud, do we retain control over our data? What will my price be after the initial contract expires? How easily can I add or remove users, and how is that reflected in my pricing? How often do you provide product updates and can we control when the updates are deployed? What is your track record for service after the sale? Who do you have locally that can help us with implementation and ongoing support when needed?